Sun Basket vs. Blue Apron: Which Of These Popular Meal Kits Reigns Supreme? When it comes to do-it-yourself meal delivery services, Sun Basket and Blue Apron are two of the top contenders currently on the market. Both options provide you with all the fresh ingredients you’ll need to prepare a great meal right in the comfort of your own home. They’re perfect for someone who loves to cook (or wants to become a better cook), but wants to eliminate the hassle of meal planning and food prep. Since they’re both here to serve the same purpose, how on earth do you choose which one you should join? To help you better understand what makes each one special and what kind of food you can expect, we’re breaking it all down for you in this post. Then, you can place your first order and have an entire week’s worth of meals planned out in an instant! No one wants to keep eating the same meal (or variation of the same meal) over and over again. That’s why variety is key when it comes to meal delivery services. What sets Sun Basket apart from many other meal delivery services is that they pride themselves on using organic produce and clean ingredients for every meal. In fact, Sun Basket is a certified organic handler. 99% of their produce is organic, plus it’s always fresh, in-season, and sourced from the country’s best farms. They are also committed to providing customers with responsibly sourced meats and seafood. The meats are antibiotic-free, as well as hormone-free and come from trusted farmers. All seafood is wild-caught and sustainably-sourced from fisherman they trust. If you’re concerned about where your food comes from, Sun Basket has you covered. What we noticed when we initially reviewed Sun Basket is that they have a variety of meal plans, all of which have a menu that rotates on a weekly basis. Their meal plans include: Chef’s Choice, Paleo, Lean & Clean, Gluten-Free, Vegetarian, Mediterranean, Vegan, Pescatarian, Diabetes-Friendly, and Quick & Easy. Not only do they have a variety of different meal plans, the meals within each plan vary weekly and are pretty unique. On the menu, you can expect to find dishes like Orange Chipotle-Glazed Pork with Coleslaw and Roasted Sweet Potato, Sicilian Chicken with Charred Lemon Chutney and Cauliflower Rice, and Korean Beef Skewers with Apple-Cabbage Slaw. As you can see, these meals are nothing boring. With Blue Apron, you can also count on receiving responsibly-sourced, high-quality ingredients for each dinner you prepare. They send their customers fresh produce, sustainable seafood, and exclusive spice blends. One of the things that’s worth noting though is that only some of Blue Apron’s ingredients are USDA-certified organic. Sun Basket, however, is focused on sending organic produce. When in comes to meal plan variety, Blue Apron has a few options to choose from. They offer their Signature plan, the Weight Watchers Freestyle plan, and a vegetarian plan. All three of those will provide you with enough services for two people. There’s also the Signature For 4 plan, which is perfect for a family of four people. Sun Basket, Blue Apron also has some interesting and unique meal offerings. Although, they do not have as many meal plan options to choose from and lack as many organic options. Everyone is looking for the biggest bang for their buck. The same goes for meal delivery services. You want to go with a meal kit that gives you the most food per serving based on the price you’re paying. Whether it’s just you, a family of two, or a family of four, Sun Basket has options to serve you. When placing your order, you’ll be able to choose whether you want enough servings for two or four people. That makes it great for a family if you have children to feed as well. Sun Basket costs about $11.99 per serving when ordering from one of their classic menus, while it’s $10.99 per serving when getting enough for your whole family. As mentioned above, Blue Apron offers two different options when it comes to serving sizes. The Signature, Weight Watchers Freestyle, and Vegetarian plans all provide enough servings for two people. It’s ideal for a couple or someone who just loves to have leftovers the next day. However, if you have a family to feed, you can go with the Signature For 4 plan. It delivers enough ingredients to make four servings of each dinner, making it perfect for you and and your kids. This family-friendly menu is different than the others though. You can still expect to find great dishes like the Mozzarella & Tomato Baked Chicken with Garlic-Parmesan Rolls, Creamy Pesto Shrimp & Pasta with Tomatoes & Zucchini, Garlic-Lime Chicken & Black Beans over Cilantro Rice, and Seared Pork Chops & Roasted Carrots with Ricotta Mashed Potatoes. The Blue Apron two person plan comes out to $9.99 per serving whereas the family plan can go as low as $7.49 per serving (based on the specific plan you choose). Whether you go with Sun Basket or Blue Apron, you can expect to find fresh, pre-portioned ingredients in each order. These services both provide you with everything you’ll need to cook a delicious dinner at home. The great thing about pre-portioned ingredients is that it cuts down on food waste and ultimately saves you money in the long run. You won’t have to purchase more of what you need. And you’ll never have to worry about unused ingredients spoiling before you can use them. When it comes to Sun Basket and Blue Apron, there are no pre-made meals here. Instead of popping your dinner into the microwave and heating it up like some meal delivery services, you’re going to have to spend a little extra time in the kitchen. The good news is that with pre-portioned ingredients, it’s going to save you a lot of prep time! 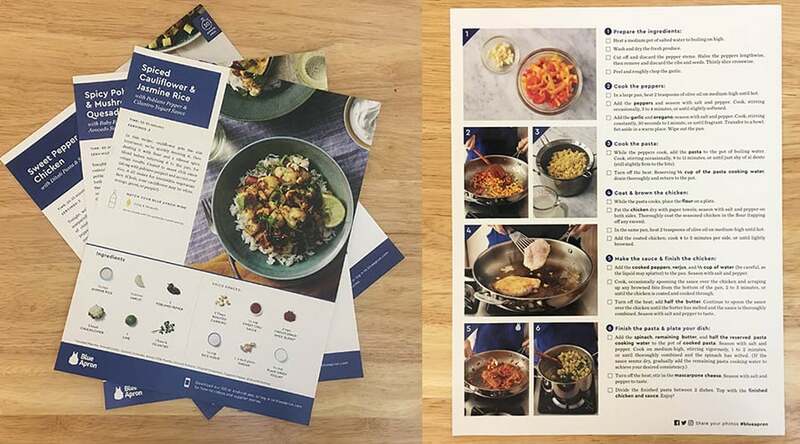 The Blue Apron recipe card is also printed on heavyweight paper to prevent it from getting damaged while cooking. It’s important that the meal kit you want to go with actually ships to your location. Currently, Sun Basket ships to most zip codes across the United States. However, they’re unable to ship to Alaska, Hawaii, Montana, and parts of North Dakota and New Mexico. If you live outside of their delivery area, be sure to check back in the future to see if they’ve expanded to be able to reach you. Deliveries are scheduled on Monday, Tuesday, Wednesday, or Thursday. It just depends on the options available to your delivery area, which you’ll be able to choose. You can expect your fresh ingredients to arrive between 8 AM and 9 PM on your selected delivery day. Also, when you order from Sun Basket, your first delivery is always free. Every week after that, you will have a $6.99 fee for shipping. At this time, Blue Apron delivers to all of the contiguous United States. That does mean, unfortunately, that they’re unable to send ingredients to residents of Alaska and Hawaii. If you’re within their delivery area, you’ll be presented with delivery dates based on your location after submitting your zip code. This way, you can choose to receive deliveries on the day that works best for you. And remember that both meal delivery services will allow you to skip a week whenever you need to. You’re also never locked into any kind of long-term contract, so you can also cancel your subscription at any time. You’re in full control! 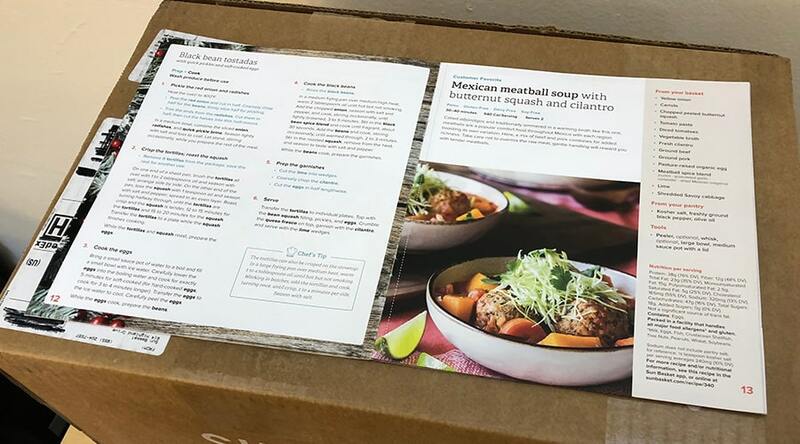 Packaging is the most crucial and often under-looked element of a meal delivery service. Not only is the actual box important in keeping your meals fresh and undamaged in transit, its recyclability is important as well. Sun Basket is focused on using eco-friendly packaging in an effort to lower their carbon footprint. Their packaging materials are either recyclable or compostable. Their box is made of recycled and virgin craft paper and the insulation is 100% shredded recycled paper between two sheets of 100% recyclable kraft paper. The ice pack can be drained into your trash or in a compost bin. The water inside will evaporate and leave a dried, compostable cotton behind. 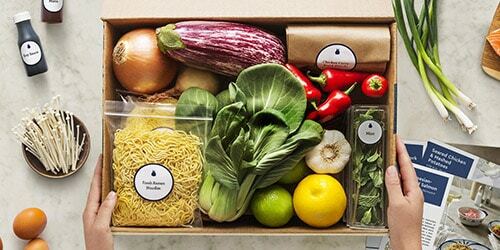 Blue Apron switches up their packaging supplies based on the season, your location, and the contents of your box. For example, in the summertime, more refrigerants will be needed to keep food cold. In the winter, they won’t need to use quite as many. Inside your box, you’ll also find insulated thermal liners to protect the food. The ice packs and many of the other packing materials are recyclable, so it’s great to do your part in saving the planet. You can put most of the materials outside with your local recycling pick-up, which is very convenient. Blue Apron used to have a program whereby you could send back your opened package in the mail and they would recycle everything for you. They have since discontinued it. From shipping issues to ingredient problems, things can always go wrong. If and when something does go wrong, you want to make sure you’re covered. That’s why a money back or satisfaction guarantee is important. Sun Basket wants you to be satisfied with every order you receive, so if there’s anything wrong with something inside your box, make sure you get in touch with them within seven days. They offer a 100% money back guarantee on all the food they ship out. When you order from Blue Apron, you can feel protected by what they call their “Freshness Guarantee.” If you receive a package and find that any ingredient in the order is missing or not in an acceptable cooking condition, you simply need to get in touch with Blue Apron and let them know. From there, they’ll either issue a refund or a credit towards future deliveries. If you experience any kind of problem though, make sure you contact Blue Apron right away. They require customers to contact them within seven days of receiving the order. So, it might be a good idea to inspect everything upon its arrival just in case you don’t make all of the meals immediately. Sometimes you need to talk to someone to get an issue sorted out. It’s important that the meal delivery service you go with gives you great customer service. To get in touch with Sun Basket, you have a few options. You can give them a call and speak to someone over the phone, submit a ticket via their support page, or join a live chat with someone from their team. If for any reason you need to get in touch with Blue Apron, they’ve made it very easy to do so. You can either give them a call at one of their customer service numbers or send over an email. Blue Apron actually has a variety of email address based on what your issue is regarding. There’s designated emails for general inquiries, meal cancellations, and wine cancellations, as well as a few others. Both Sun Basket and Blue Apron have referral programs that allow you to spread the love to friends and family. This gives you the chance to earn credits toward future meals, thus saving you money. 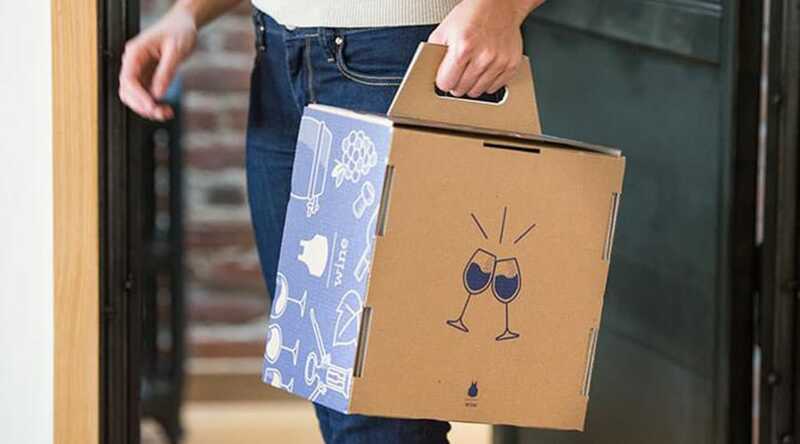 If you’re a wine lover, Blue Apron has one more offering that just might seal the deal for you. They have a monthly wine delivery service that allows you to gain exclusive access to wines from renowned winemakers. Each one is sized to hold the perfect amount of wine for two people. It’s a great way to get the ideal pairing for your weeknight dinner or just a casual Sunday at home. Not only that, but this service cuts out the middleman, which allows them to deliver you high-quality wines at better prices than what you’ll find at the local liquor store. Instead of going from the vineyard to the winemaker, the bottler, the wholesaler, to the retailer, and finally to you… The wine is going from the vineyard to Blue Apron and then landing on your doorstep. We’ve reached the end of the Sun Basket versus Blue Apron battle. Who won? Well, that really depends on what you find important in a meal delivery service. Sun Basket has more variety when it comes to their meals and meal plans. Again, here’s the list of meal plans Sun Basket offers: Chef’s Choice, Paleo, Lean & Clean, Gluten-Free, Vegetarian, Mediterranean, Vegan, Pescatarian, Diabetes-Friendly, and Quick & Easy. As you can see, there’s a reason it’s one of our favorites. While Blue Apron doesn’t have as much variety when it comes to meal plans, they do win in some other key areas. For example, the Blue Apron recipes cards are more detailed. One of the aspects of their recipes cards we love is that they include images for each step of the recipe. This makes following a new recipe much easier since you can simply look for the image that is as closely related to where you are in cooking the meal. Lastly, Blue Apron offers an optional wine pairing (for a fee). If you want the full meal “experience”, this could be a fun addition but it’s not a huge game changer. Overall, both are great meal delivery services that we’ve enjoyed. Which one if your favorite? Let us know in the comments below!